I think that I have no much to say for this wallpaper but that. cool wallpaper, i hope that someday the performs a bankai XD congratulations! Buen wallpaper, me encanta Rukia! Gran trabajo y gracias por compartir. Don't worry about the blur, because IMO they just added the mysterious air around Rukia. I think you did a great job with the wallpaper, it looks enchanting. 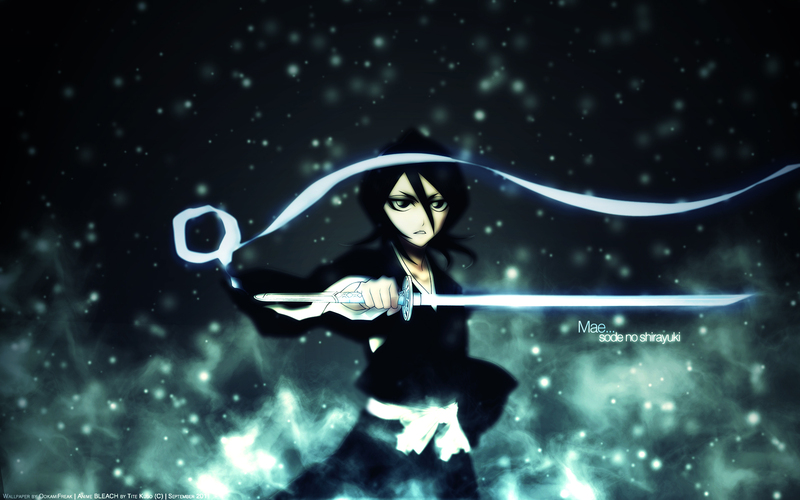 And also, did you vector Rukia for this wallpaper? There are some part of the dark lines on her looks sharp and out of place. Everything looks blur around her, and it's weird seeing some of the area left untouched or 'un-blur'. Maybe it should be blurred a bit. Someone already point out the 'Mai..Sode no Shirayuki' thingy so I won't be saying the same thing again. The celestial atmosphere in this wallpaper is great; though I have no idea what the Japanese lyrics mean, lol. Overall, you did a nice job blending Rukia; I love the lighting & soft textures. can you give some tips on making the background? i really have no idea how to start. But your picture looks really good.